ARM Cuauhtemoc in Odessa. Photo: Ukraine MoD. 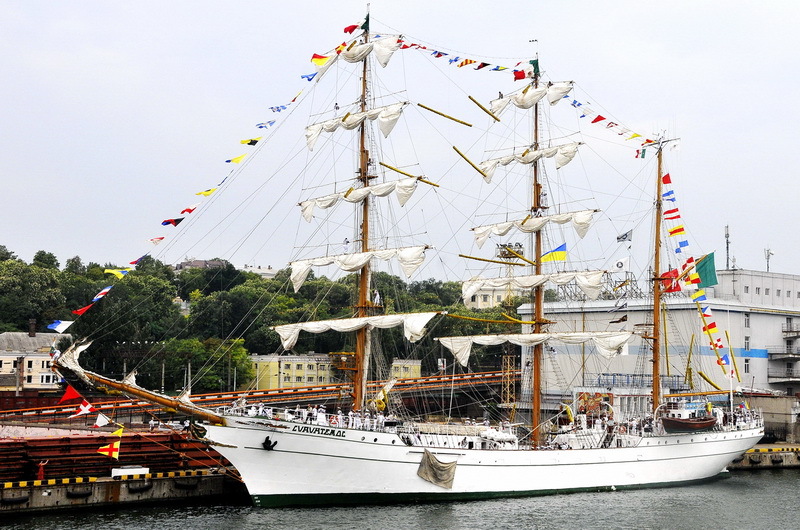 The Mexican naval training ship ARM Cuauhtemoc is in Odessa, Ukraine for a port and good will visit. After leaving Istanbul on 27 July 2011, she sailed to Odessa arriving there on 30 July. The ship was welcomed, by the deputy commander of Western Naval Base, Captain 2nd Rank Aleksandr Dereschukom, Ambassador of Mexico to Ukraine, Ms. Berenis Rendón and other officials from the Mexican side . The commander of ARM Cuauhtemoc, Captain 1st rank Marco Antonio Vila Vivaldi, said that this visit has a friendly character and is to deepen cooperation between two countries in military and cultural spheres. The training ship is on an educational sailing trip called “Mediterranean – 2011” and has visited many countries. The ship will leave Odessa on 4 August 2011.